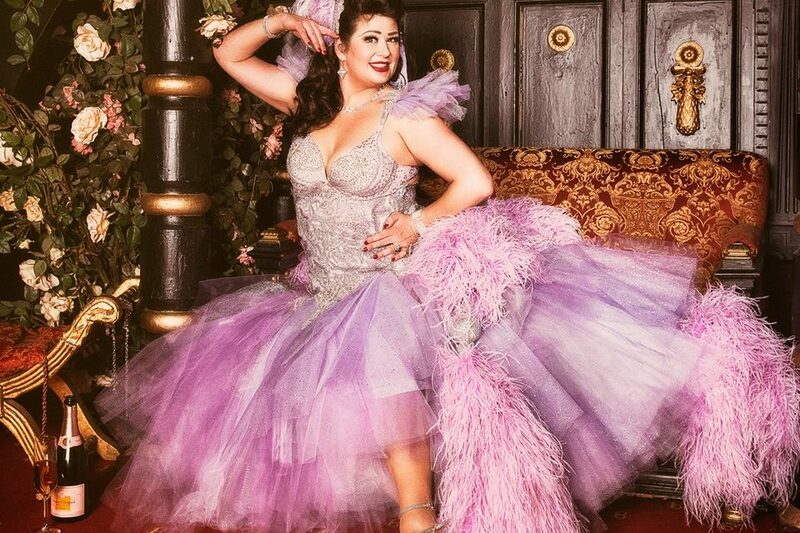 In a new series on 21st Century Burlesque Magazine, fabulous costumer blogger and performer Viv Clicquot shares valuable tips and tricks, starting today with showstopping shoes! Hiya! So today’s post is about how to turn street shoes into super glam performance shoes. If you have a pair of shoes that fit great, you can move and dance in and are comfortable, by all means use them on stage! Obviously you can just wear them as is, but it doesn’t take much time and effort to make them amazing. Ok, so here’s a pair of fairly high heels that I am actually am able to dance and move in. They’re just cheap street shoes, but the proportion and balance just works well for me. The very first thing you MUST do, whether you are wearing them on stage or not, is remove and clean ANY evidence of labels on the sole of the shoe. So once I scraped off every trace of this label off and gave it a good solid wipe down with some windex to remove any grease, I thought I would try the Christian Louboutin trick I told you about earlier. While I had often used nail polish on all sorts of things, I had never actually tried to use it on the sole of a pair of shoes. Well, lo and behold, it worked like MAGIC! I want to do this to all my shoes now! I grabbed a bottle of silver polish I already had; this one was called Silver Dollar by Revlon and if it’s not discontinued I would definitely buy it again because it looks so fab. I mean, just look at that shiny finish! This was just two coats of Silver Dollar, allowing it to dry between coats just like on your nails. I propped one wet shoe in front of a small space heater to dry while I painted the other one. I’m highly impatient. Then, just like on my nails, I added a top coat of clear. I let them dry overnight before using gem-tac to add some crystals, and holy COW these look soooo good! Now, keep in mind that different polishes have different coverage properties. Red is one of the most notoriously difficult; I would plan on a minimum of four coats. Any polish with a reflective component like glitter, shimmer, or pearl is going to have much better coverage than polishes that are just a solid cream finish. See the little rubber tip on the bottom of the heel? Those are called ‘lifts’ and I paint them the same colour as the shoe. Why? Because they were black, and most stages are also black, which means that the 1/4″ of lift height just visually blends into the floor and makes the heel look shorter than it is. Hell, if you are wearing stillettos on stage, every 1/4″ of extra heel height counts! This is something I’ve been doing for years; why I didn’t continue this on the rest of the sole of the shoe before now, I do not know. Now this next photo probably takes me into the realm of obsessive. But it really makes the shoe look SOO much more expensive than it is. What this photo shows is how I also painted all the exposed edges of the sole, where it meets the fabric on the vamp and heel, in the same silver. Look at any really expensive pair of exquisite shoes – these are the types of details that separate a $600 shoe from a $100 or even $30 shoe. These happen to be the $30 variety. This is why I love such trickery! Of course I proceeded to add crystals to this already sparkly shoe because that’s just my weakness, but that really wouldn’t have been necessary if I didn’t feel like it. Just painting the soles, edges and lifts already make a HUGE difference. Oh, and yes, I have since spent three hours rehearsing in these babies, and the nail polish did not BUDGE. It’s still so slick it looks wet. So there you go! I would love to see photos if any of you try this.